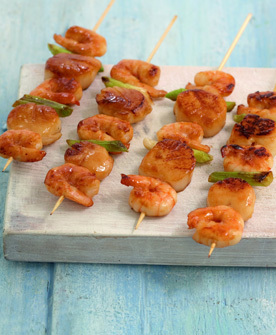 These Prawn And Scallop skewers are always a big hit at every barbeque. If you can, it's always good to make a double quantity, as it has happened where I've cooked these and not actually had a chance to eat one. Plunge onions into boiling water, return to boil, cook for 5 minutes. Drain, rinse under cold running water, drain and dry. Shell and devein prawns, cut nearly through to the back and butterfly (spread open). Thread prawns, scallops, bacon and onions onto skewers, making sure to end with an onion. In a bowl, combine oil, melted butter and dill. Brush generously onto skewers. Brush barbeque rack with oil, cook skewers, basting frequently with remaining marinade. Turn once, until scallops are opague - about 6-8 minutes. Squeeze over some extra lemon juice before serving. Serves approx 8, although these are so delicious that your guests will be fighting eachother for them.